Zombie Attacks: Is Book Conservation Doomed? A zombie idea is one that we are not quite sure where it came from, keeps popping up, and stubbornly refuses to die. The latest undead idea I’ve been hearing more and more of is that book conservators do not need to know all that much about the craft of bookbinding. I’ve asked Cathy Baker, Chela Metzger, and Maria Fredericks to respond to this question: Do book conservators need training in the craft of bookbinding? Cathy Baker is a paper conservator, educator, editor, printer, proprietor of The Legacy Press, and an inspiration to many of us. There is a great interview with her on The FIne Books Blog. I often consult her book From the Hand to the Machine: Nineteenth Century American Paper and Mediums: Technologies, Materials, and Conservation. For more of her thoughts related to this topic, see pages xii-xiii, 3-5, and 236. Baker writes: I feel it is essential to the development of conservation sensitivities to have extensive practical experience in the craft(s) that was/were involved in the creation of artifacts if one is to make informed decisions about their preservation/conservation, and this holds true for any conservation speciality. Thus conservators of art on paper should practice traditional hand papermaking, all of the major printing techniques–relief, intaglio, and lithography–and drawing mediums–pen and ink, watercolors, dry-medium drawing, etc. And for example, how anyone can expect a book conservator to understand the best way to preserve/conserve any book while having little/no practical bookbinding experience (both one off AND edition binding) is beyond me. If that should ever be the case, I think the conservation profession is doomed: either conservators will routinely make serious treatment mistakes or treatment will cease altogether because of the (unconscious?) discomfort the conservator feels about her/his lack of understanding about artifacts. Neither situation is good for the preservation of our cultural heritage. A few of my own thoughts: Possibly this idea was born when book conservation was founded in the US in the 1980’s. More specifically, the integration of book conservation into the larger arena of art conservation, the concept of minimal intervention, and the concept of collections conservation likely had influence. Most other art conservation specialities, while encouraging and requiring students to learn about the materials, techniques and history of the art form, are no where as closely related as book conservation is to the craft that produced them. So it is understandable why someone from an art conservation background might question the uncomfortably close relationship between bookbinding and book conservation. It is likely not a good idea to project too much on the abstract idea of minimal intervention which will mean different things to different people. The concept of collections conservation unintendedly reinforced the idea that the head and the hand were separate entities and the head (the conservator) could direct and abstract hand (the technician) to perform repetitive or mundane tasks, or work on material not considered valuable enough for a conservator. The beginnings of separating out craft from a conservators skill set? Since bookbinding craft skills are still transmitted in the traditional manner of close contact with skilled practitioners, I would posit that book conservation, as a field, has an additional responsibility to preserve not only the bookbindings, but the craft skills and techniques that produced them. And the intimate knowledge of these craft skills not only manifests itself in treatments such as rebinding (traditionally almost the only treatment? ), rebacking, resewing, but in the ability to determine what should not be treated, which are sometimes the hardest and most time consuming decisions. With objects as numerous, international, and subtle as bookbindings, it can take a long time to understand what might be unique or rare and what is oridinary. As Baker mentions, lack of skill in performing more advanced or invasive treatments could lead to fewer of them being done, possibly to the detriment of the object. Then again, a cruel irony is that once an object is treated it tends to be re-treated in alarmingly short periods of time. Everyone—hand bookbinders, book restorers, conservators, technicians and repairers—should know something about edition binding, but I have found it to be almost a completely different field: possibly more akin to music or some type of athletic performance. It takes very long repetitive training and constant practice to gain and retain the hand skills and speed to make it profitable. I wonder it it is even possible to expect a modern conservator to be able to learn this in a three or four year program? Bookbinding training programs like North Bennet Street School give a solid foundation, but even old-timers have confided that skills can deteriorate in frighteningly short periods of time; things that once were easy had become hard again. So I guess another question is what kind of hand skills can a book conservator possibly have, given the lack of practice and repitition, and the fact that all materials present unique challenges and circumstances? Maria Fredericks is the Drue Heinz Conservator at The Thaw Conservation Center of The Morgan Library and Museum. She has been a leader in the field of book conservation for decades and teaches widely. Fredericks writes: In my opinion, book conservators should continue to learn as much as possible about the technical history of craft binding, in exactly the same manner that conservators in every other specialty devote years of study to the technologies and materials used to make the objects under their care. Understanding the structural and material evolution of the codex form over time is essential to recognizing what is significant and authentic about bound objects in their cultural context(s), which in turn informs the conservator’s judgment in the selection of appropriate preservation options. 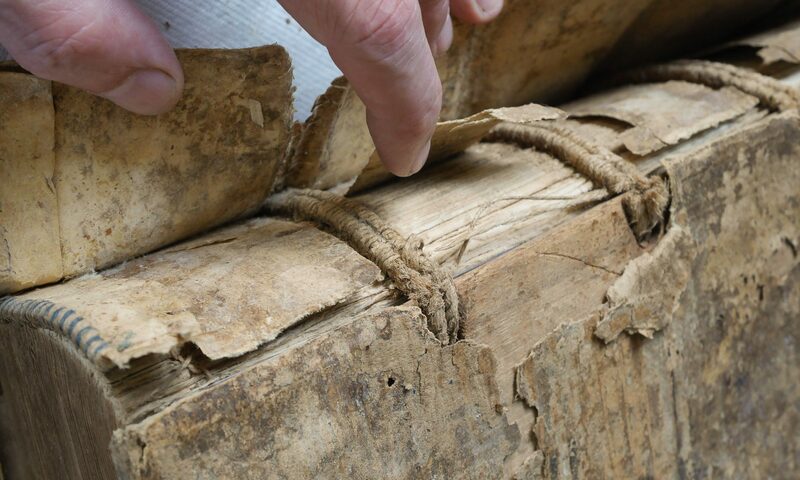 In more practical terms, a deep understanding of binding mechanics is required so that books may be repaired or re-bound in ways that prevent further deterioration, while preserving historically significant features. A profound knowledge of how bindings work can only be gained through a combination of observation and hands-on practice, including patient exploration of a vast number of structural and material variations, and repetition of core skills. Even in a culture of minimal intervention, re-binding or significant structural intervention is required often enough that a book conservator must possess the skills to re-sew and re-bind text blocks with a broad range of requirements for safe handling and display (e.g. manuscripts on parchment, printed books on fragile or brittle paper, photo albums, ledger and stationer’s bindings, amateur bindings, Islamic bindings, East Asian bindings, to name a few). An important question is how to acquire these diverse binding skills, and keep them fresh enough to be used with assurance when they are needed. We are far removed from the kind of fast-paced repetitive production work carried out by trade binders and restorers of the last several centuries, that honed certain skills but perhaps discouraged creative thinking. Conservators, by contrast, must consider each item or group of items individually, and because library collections are often quite diverse, the opportunity to repeat a complex repair technique or re-binding structure with any frequency can be rare. In addition book conservators must be educated in the conservation of paper, parchment, leather, and other materials that tend to appear in books. A strong, early foundation in bookbinding would seem ideal, creating a repertoire of basic operations (variations on sewing, forwarding, covering) that becomes instinctive and is always ‘on tap’. In recognition of this need, the North American conservation training programs, with funding from the Mellon Foundation, offer both intensives and semester courses focused on practical bookbinding in their curricula for library and archive conservators; the European programs with which I’m familiar also have this type of course work. Some new post-graduate fellowship opportunities for rare book conservators, which will allow important additional training and research time for recent program graduates and other emerging book conservators, are encouraging, and I hope mark a new trend. In summary, the acquisition and use of binding skills continue to be central, in both the training and the ongoing work of book conservators. One last thought on minimal intervention. In spite of criticism from proponents of more traditional restoration, minimal intervention in conservation treatment now feels right in step with the seeming explosion of academic programs of study in the ‘material book’, and the growing number of opportunities for interdisciplinary discussion of books and manuscripts as physical objects. Conservators may have been ahead of that curve for a few years, but it now seems universally recognized that over-restored books, like other similarly abused artifacts, are stripped of a significant percentage of their meaning. The excellent news is that conservators, curators, bibliographers and humanities scholars are increasingly working together to interpret material evidence found in books and bindings. Hurray! Chela Metzger is Conservator of Library Collections and Adjunct Assistant Professor at the Winterthur/ University of Delaware. Quite likely she has more experience teaching book conservation than anyone in the US, and her research interests include blank books. Metzger writes: In 2006 the consdist list, a conservation list serve, had a several month long back and forth discussion that is relevant to the intersections of craft skills, minimal intervention, and ethics in conservation. Mr. Hassard never revealed the senior conservator who made the quote that starts the post, and he also noted in later posts in the thread that he was mainly interested in furniture and decorative arts conservation. The entire thread is archived under the subject heading “conservation principles” in the COOL site. I enjoy thinking about the issues of craft in book conservation. I must entertain the idea that minimal intervention is a possible curtain to hide lack if skill, since it is not uncommon to hear that critique of conservators. I see conservation as an an approach and as a problem solving activity. I think it is better described as a thought process and a set if relationships than as a list of techniques. That said, a book conservator should be very clear about when an agreed upon best treatment is beyond their skill level. Conservation treatment, which is not the only thing many conservators do all day as a general rule, must be done with unalterable respect for and curiosity about the materials and those who made them. I would argue that we are not the last hands that will touch these objects, and should not put our treatment hand skills above the actual book in question. It’s an interesting professional disappearing act sometimes. Personally, I find the decision to rebind agonizing most of the time. But once that decision has been made, rebinding can be very straight forward compared to a “minimal intervention” treatment. Engineering an appropriate minimal intervention can be very time consuming and tricky. It can also involve skills and materials not typical in one-off or edition binding. Bookbinding skills are necessary, but not sufficient to the book conservation decision-making process in my opinion. We have lots to learn from object and paper conservators. Reblogged this on trainee archive conservator.